In today's post about the Nimzo-Larsen Opening, I mentioned the spectacular performance by Boris Spassky where he routed Bent Larsen, one of the world's strongest chess players. Spassky, playing Black, sacrificed a knight and a rook to decisively queen a pawn and win in just 17 moves. 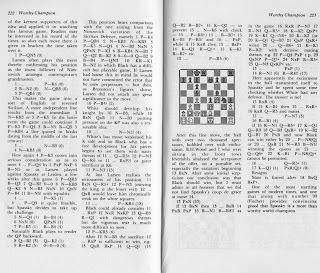 Our scan, taken from Cafferty's book "Spassky's 100 Best Games", gives detailed analysis of the game, which was played in 1970 Rest of the World vs. USSR match.